We're on Our Way Again! Happy Thanksgiving to everyone! We will enjoy turkey and quite a wide variety of foods today as we have an international crew. Today, I would like to tell you about one of the scientists participating in Expedition 329. 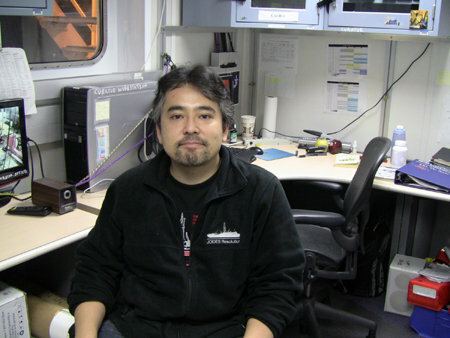 Yuki Morono is one of the microbiologists sailing on Expedition 329. He was born in Fukui, Japan and moved to Tokyo with his family when he was six years old. After completing his PhD, he left Tokyo and moved north to the country side city of Tsukuba to spend 3 years as a postdoctoral fellow. Then he moved south to the city of Kochi and started his current career. The city where he is living was less crowded and hectic; he still enjoys living there because it offers a more peaceful life, even though he has had to give up some of the conveniences of big city life. As an undergraduate, he was interested in the biotechnology field and studied iron corrosion of pipes in the context of the interaction with microbial activities. Yuki found that microbial activity enhanced corrosion by creating micro-environment differing oxygen levels and he became interested in microbes that could live in polluted environments and break down the pollutants. He went on to earn a PhD in bioengineering from the Tokyo Institute of Technology. Here, Yuki did research on aerobic and anaerobic microbes that can degrade or use chlorinated hydrocarbons for respiration in the environment. While earning his degree, Yuki visited JAMSTEC (Japan Agency for Marine-Earth Science and Technology) for doing some analysis on microbial DNA. There, he met Fumio Inagaki, one of the co-chiefs of this expedition, who asked Yuki to join his group later on. Yuki entered the field of science because he likes to find something unexplored or finding a way to do it; the field of science fulfills that interest. His engineering ability is used for developing or modifying techniques for subseafloor study, which is difficult to do with current techniques. Discovering new things or ways gives him a sense of accomplishment, in college he worked with others on developing a human-powered airplane and today he is interested in developing techniques to find new microbes. In his spare time, he likes to spend time with his children and to read books.